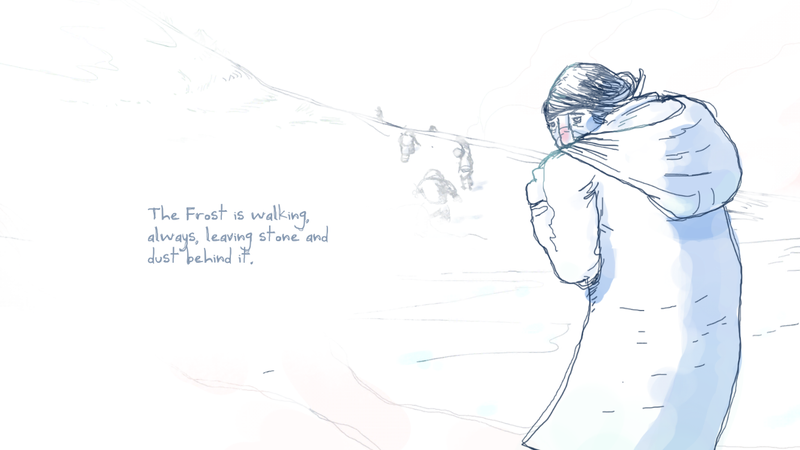 The mobile game Frost is about a group of migrants in an ambiguous apocalyptic scenario making their way to a refuge from the cold. It’s beautiful, but doesn’t work well enough as a game. Frost is a card-based game. Cards in your deck represent the migrants and their supplies. As you play you are tasked with spending your resources temporarily to travel on, spending them permanently to expand your deck, or rest if you must. Each time you rest, the frost catches up to you, and when the timer gets to zero you lose, and presumably everyone dies. It’s a juggling act, and when everything works it can be engaging. But frequently the mechanics thrown at you don’t mesh well. It’s too busy at times and too inconsequential, ultimately hiding the things that can make it compelling. The game is gorgeous and looks like a French graphic novel. Most of what you see is washed out in whites and blues, except for the pink tip of a survivor’s nose or the faded purple of their scarf. These images are streamlined and cohesive in a way that highlights everything that isn’t working. The problem is, every time you play a round, the game throws more and more stuff at you in what feels like an effort to convince the player they’re getting their dollar’s worth. It doesn’t feel like the game is adding more mechanics to increase the challenge. It’s just more stuff. Now you gotta deal with wolves, and crafting, and different kinds of resources that aren’t satisfactorily explained. When you unlock the next difficulty there are more win conditions. Every round unlocks more cards. This is too much stuff, especially if you’re playing on a phone and your ham hands just knock into the increasing amount of things that start to clutter the board. A bounty of stuff to do in a game isn’t inherently bad, but the way you’re forced to play Frost clashes with the game’s tone. The sparse sound design suggests loneliness and struggle. The illustrations are soft and delicate, and then when you dive into it you’re juggling more and more resources and systems until you feel like your brain is about to dribble out of your ears. The opening narration that greets players before each round promises a solemn, meditative journey. The way the game is structured, however, makes you look at everything as a series of numbers in a spreadsheet. When the game offers you a chance to turn excess survivors into more food—using a card called “cannibalism”—there doesn’t seem like a good reason not to do so. It’s contradictory to frame this game as a story of survivors and then make the survivors disposable. Who cares if we’ve outrun the frost if everyone has been eaten in the process? These flaws are redeemed, somewhat, by an alternate mode of play that you unlock after play your first round on the medium difficulty. In this scenario, you are tasked with playing as a father keeping his family alive. If any of the four survivors you start with die, you lose. Suddenly, decisions feel like they have weight. You start with few resources and have the option to spend a survivor temporarily to scavenge for more. But each time you scavenge, there’s a chance that a survivor may die. This is the version of the game worth playing, one where I actually feel an impetus to win. Here, all that care put into the presentation means something.